Printer is a 2016 model and very lightly used. This printer was assumed by the new owner and was barely used by the original owner - less than 1000 linear feet printed! Comes with ink on board and some additional ink. HP DesignJet L310 54" Latex Printer Island Clean Air Duster 3000 - Fume Control Easymount SH 63" PSA Laminator w/Air Nip Pressure & Heat Assist, NEW!! 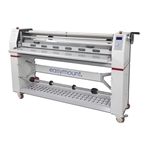 Easymount Sign 63" PSA Laminator w/Heat Assist, NEW! !